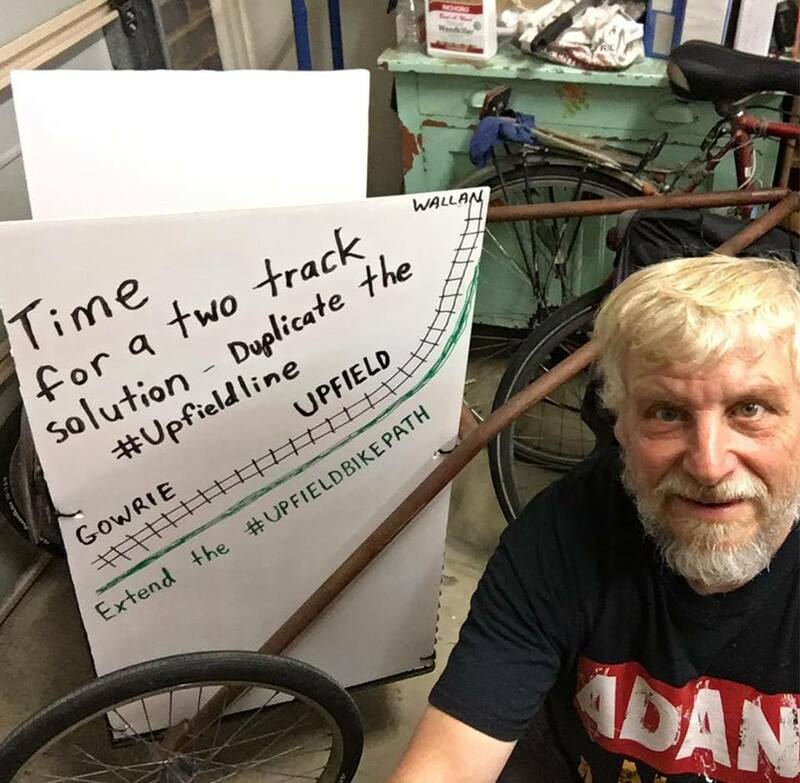 Extend the Upfield Bike Path to Upfield endorsed this campaign by the Upfield Transport Alliance. Over 100 people attended this first rally at Upfield. We need good public transport so people can choose and use low emissions transport options, whether the train or cycling. This rail line needs to be duplicated between Gowrie and Upfield to improve service reliability and frequency, and should be extended through Roxburgh Park to Craigieburn and Wallan so that people in outer suburbs have access to good public transport, will drive less and reduce congestion on inner urban streets such as Moreland. It is a matter of social equity and reducing transport emissions. Any track duplication should also involve extending the Upfield bike path to Upfield. The Level Crossing Removal Authority were negligent in not doing any cycling infrastructure construction as part of the Camp Road Level Crossing Removal in December 2017, January 2018. A number of our campaign members attended cycling up the Victrack easement from Gowrie and then along the Sydney Road footpath to the rally (We had two dogs on the cycle as well). Thanks also to Greg from Moreland BUG, and to Catherine Deveny (Reason Party Candidate for Brunswick) for seeing first hand the problems and issues. Brian, who works at Ford and sometimes cycles to work, cycled with us to Upfield. I am sure there are more workers at Ford, and other employers, who would also cycle commute sometimes if the Upfield path was extended and available. It just makes so much sense. We saw first hand the cabling cemented into place on the pedestrian/cycling portion of the M80 rail bridge, when there was more than enough room for the cabling and a second track on the major part of the bridge reserved for the rail lines. Although we could have cycled over the bridge, the fence and locked gate at Camp Road would prevent our movement further north. Public access has gone backwards after level crossing removal. We had to venture to the massive M80 intersection to cross on the footpath. We then cycled up the footpath beside Sydney Road to Gentiles Road. (This is mostly uphill, so slower cycling speed, dangerous to cycle in the left lane) Several roads crossings and many driveway crossings highlight that it is dangerous even cycling on the footpath. I also highlighted that VicTrack has constructed a well made gravel track all the way from Camp Road to Barry Road as part of trenched and buried signal cabling upgrade. It is mostly fenced off from public access and use. We have a Transport Integration Act, but I have seen little integration between LXRA, VicTrack and VicRoads to construct the Upfield path. This is a failure of governance in the bureacracies, but just as much a failure in advocacy and governance by Frank McGuire MP (Broadmeadows) the Minister for Public Transport Jacinta Allan and Minister for Roads and Roads Safety Luke Donnellan. I spoke briefly, but passionately, at the rally, advocating for rail duplication, extension and for extending the Upfield Bike Path. I was wearing 3 hats: Extend the Upfield Bike Path to Upfield, Sustainable Fawkner & Climate Action Moreland. The rally was facilitated by Cr Sue Bolton from Moreland Council and Cr Jodi Jackson from Hume Council, reflecting the importance of upgrading the rail line to both municipalities. The Mayor of Moreland Natalie Abboud was also present at the rally, along with Moreland Cr Oscar Yildiz (standing as an Independant for Pascoe Vale). Other speakers included Abdul Aziz, an IT worker, regular commuter and Fawkner Resident, Sheridan Tate from the Broadmeadows Progress Association, Jo Stanley from the Brunswick Residents Network, Victor Moore and Kath Larkin from the Rail Train and Bus Union , RTBU/ Kath Larkin. After the rally five of us dared to cycle along Barry Road, then turned right onto Sydney Road and cycle all the way in the left lane to Fawkner. This is a dangerous stretch of road, a 70km/hour zone, and VicRoads has so far refused to provide any safe alternative for cyclists, which construction of the Upfield Bike Path extension would provide, just 200 metres further west. We cycled as a fairly tight group in the left hand lane at a reasonable pace. It was a real blast being able to cycle along this road with some confidence and visibility. Cyclists should not have to do this for our safety. VicRoads needs to provide a safe cycling route through Campbellfield. The Upfield-Craigieburn strategic cycling corridor could provide that safe route. Let’s provide a sustainable future for our children: Duplicate the Upfield line now. Posted on November 4, 2018 November 4, 2018 by John EnglartPosted in Campbellfield, LXRA, M80 railbridge, VicroadsTagged cycling, protest, rally, Sydney Road, Upfield, Upfield Transport Alliance, Upfieldline.